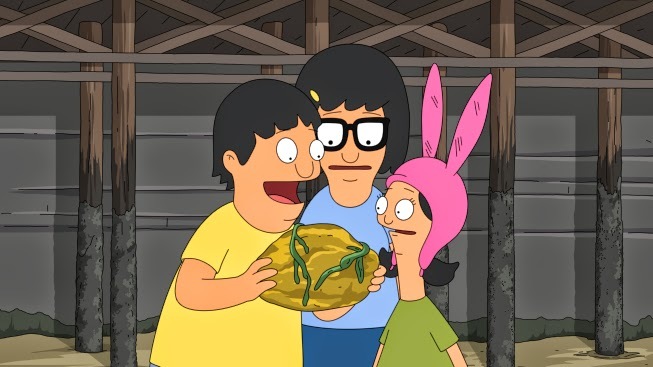 I recently pointed out how Bob's Burgers sometimes takes on overdone storylines while also trying out unique takes on situations. Well, in this next batch of episodes, the writers continue to play with ideas that have been seen before (hello, hit-to-the-head = psychic!) with pop culture-y, timely jokes (Equestranauts was perfect for this series! not a stretch until the tattoo part!). Plus, they bring the viewers back to life in a seaside town (where else would you find ambergris? ), and simultaneously freak them out by remembering just how kooky the family can be (Gayle's sleeping arrangements had me wide-eyed and questioning why the kids even know where she lives...). There are a few episodes left this season, and I look forward to seeing what else they can cook up!